To celebrate National Sandwich Day, this toasted sandwich is a nice change of pace from loaded Dagwood and cheesy layered concoctions. I enjoy the hell out of them, but sometimes I want something simpler. Spread the butter and garlic slices over the two slices of toast. Lay down the tomato slices on one slice of toast, and lightly salt them. Lay down the cucumber slices on the tomatoes, and lightly salt them. Place the second slice, butter-side down, to complete the sandwich. Thursday is national sandwich day! So eat a sandwich! This recipe blends Lebanon and Syria in a sandwich. This sandwich works best with a bread made from sweet dough, a yeasted white flour loaf made with eggs and extra sugar. I like to use a Syrian-style anise bread with mahleb, but any sandwich bread will do, especially breads like the Portuguese sweet bread from the The Bread Machine Cookbook. Don’t skimp on the butter, do skimp on the salt, since you’re putting it on twice, and raise a toast (pun intended) to National Sandwich Day! You’ll most likely have slices left over from the tomato and cucumber, so put them on the side with salt or salt and pepper, as you prefer. Drink with iced tea or some other not-particularly-sweet beverage, and relax. I’ve been fascinated by cucumber sandwiches ever since reading The Importance of Being Earnest, and while this is nothing like that, I did have the urge to make a cucumber-focused sandwich after having some left over from a Lebanese garlic-tomato-cucumber salad. This is pretty much that salad (minus the lemon and olive oil, plus butter) on toast. Lots of eggplant, sweets, and mahleb. This is a very good cookbook. This is a nice simple cookbook with specifically bread machine recipes. I tried the raisin bread recipe and it turned out fine. Not up to the hype it was given, but a perfectly fine bread. The two Portuguese breads are great, as is the Austrian malt bread. Varying a Syrian recipe from Helen Corey, this anise and mahleb-flavored bread is perhaps the best tomato sandwich bread I have ever tasted. The full text of The Importance of Being Earnest in three acts. Garlic, eggplant, and chickpeas. You can’t hardly go wrong with Lebanese food, and this book is great. If you have a table saw or chop saw, making a bread slice guide is a snap. To be honest, I’m not sure the whole wheat bread from The Enchanted Broccoli Forest is even doable by hand. But I have managed to modify it so that it works very well in a bread machine. 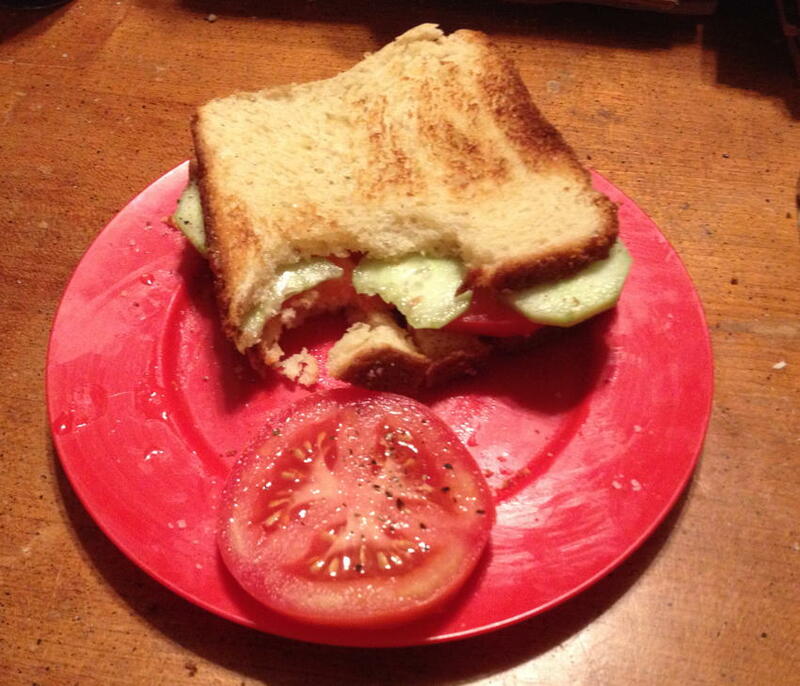 Tomato-cucumber sandwich on sweet bread last modified October 19th, 2016.